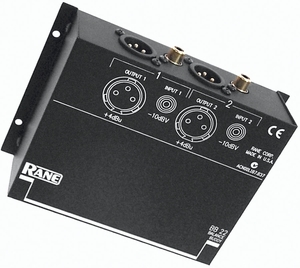 The Rane BB 22 Balance Buddy is a handy professional-grade tool used to provide isolation for and convert unbalanced -10 dBV consumer level RCA outputs up to balanced +4 dBu professional XLR inputs. The BB 22 converts one pair from -10 dBV to +4 dBu. There are two male XLR connectors and two RCA jacks. Unbalanced lines should always be kept to 10 feet or less to prevent undesireable effects such as hum and noise. The BB 22 allows conversion to balanced lines that can be run across a studio or a house without loss of signal quality. For instance, a BB 22 may be mounted to the back of a jukebox converting its unbalanced outputs to balanced lines, feeding an amplifier in another room. Signal-to-noise performance is perfectly preserved using the BB 22, since it uses only passive transformers to convert signal levels. It adds no additional noise whatsoever. Use of professional quality nickel core ('80' Ni) transformers guarantee low distortion, wide bandwidth and high signal level handling capability. The BB 22's isolation transformers provide a quick and affordable answer to most jobs requiring signal level conversion and output balancing.